Bearing its name is an ensemble that gathers different projects, conceived and performed by the plucked strings specialist Bor Zuljan. Centered around the large Renaissance period, the original and rarely heard programmes, imbued with improvisation, combine creative approach with research. 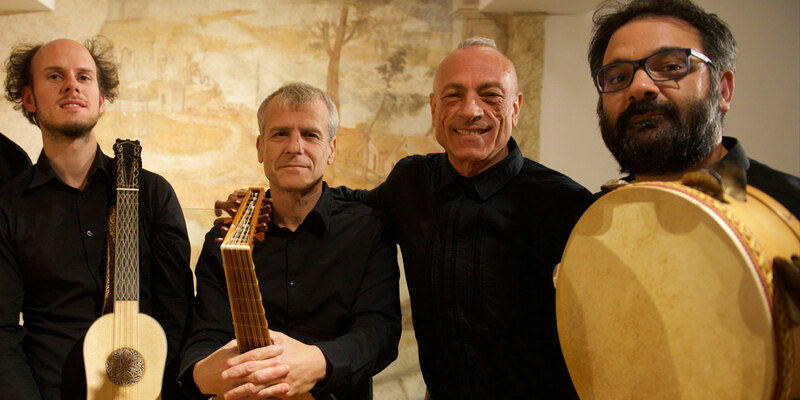 The ensemble has collaborated with soloists, such as Pino de Vittorio, Jan Van Elsacker, Jeffrey Thompson and Vivabiancaluna Biffi and has performed in some major European festivals. The first CD of the ensemble, ” Gorzanis – La barca del mio amore” has been released in 2018 by the label Arcana (Outhere Music) to great critical acclaim. Pino De Vittorio, actor and singer was born in Leporano (Taranto), Italy. After the artistic startup dedicated to recovery of the Apulian tradition, together with Angelo Savelli founds the musical theater company Pupi e Fresedde. Then he enters and becomes part of the theater company of Roberto De Simone, playing principal roles in Mr. De Simone major works: Mistero Napolitano, Li Zite ’Ngalera, Opera Buffa del Giovedi’ Santo, La Gatta Cenerentola, Stabat Mater with Irene Papas, Requiem in memoria di Pier Paolo Pasolini, Le 99 disgrazie di Pulcinella, Il Drago. These performances run worldwide: New York, Edinburgh, Buenos Aires, Rio de Janeiro, San Paulo, Frankfurt, Berlin… He debuted at the theater San Carlo with Il Crispino e la Comare of Ricci brothers, that was replicated at Fenice of Venice and the Champs Elyseés of Paris. He has participated several times at Maggio Musicale Fiorentino and in the modern version of Monteverdi’s Orfeo, reviewed by Luciano Berio, at the International Weeks of Naples with L’Idolo Cinese of Paisiello, the Pulcinella and the Histoire du Soldat of Stravinsky directed by Salvatore Accardo. He has given concerts for the Accademia Chigiana of Siena and Settembre Musica of Torino and San Maurizio of Milano. He performed in London for the royal family of England with the Daphne of Marco da Gagliano. With Rinaldo Alessandrini has sung the role of the nurse in the Monteverdi’s Coronation of Poppea (Opéra de Paris). Then together with Antonio Florio he founded the baroque ensemble of La Cappella della Pieta’ dei Turchini, with whom he participated in numerous concerts at the International Festivals in France, Japan, China, Colombia, Mexico, Argentina, Brazil, Israel, Spain… In addition, many more baroque works with Florio : La Colomba Ferita of F. Provenzale (San Carlo, Teatro Massimo of Palermo), La Finta Cameriera of G. Latilla, the main player in Pulcinella Vendicato of Paisiello (Teatro Bellini of Naples and City of Mexico), Li Zite ’Ngalera (in theater Piccinni of Bari), La Festa Napoletana, Il Disperato Innocente of Boerio (Clermont-Ferrand), La Partenope of L. Vinci (Seville, San Carlo of Naples, Leon, Santander, Coruna), L’Ottavia of D. Scarlatti (S. Sebastian). He has recorded with La Cappella dei Turchini numerous discs of sacred and secular music for Synphonia, Opus 111, Naive, Eloquentia, Glossa. The last recorded works: “Le Tarantelle del Rimorso” (Eloquentia), “Canto de la Vida” (Deutsche Grammophon), “Fra’ Diavolo” with Accordone directed by Guido Morini and Marco Beasley (Arcana) and “L’Adorazione dei Maggi” of Cristofaro Caresana with the Turchini of Florio (Glossa), “Siciliane” and “Occhi Turchini” with Laboratorio ‘600 (Glossa) and “Gorzanis – La barca del mio amore” with La Lyra (Arcana). In 2014, in a role of Nurse he partecipates at the opera L’Incoronazione di Poppea produced by Robert Wilson and conducted by Rinaldo Alessandrini, at the Opéra de Paris and at the Teatro alla Scala of Milan.